Urban Horse Cannot Over Stress The Importance of Correct Sizing for All Horse Boots! Then a second length measurement from the butress line straight up and right to the back of the heel bulbs. Compare your measurement with the appropriate size chart. Please note that each hoof boot style has its own unique size chart for guidance. Ideally, the length and width measurement will fit into the same size. If the length and width measurements indicate different sizes, select the larger size. 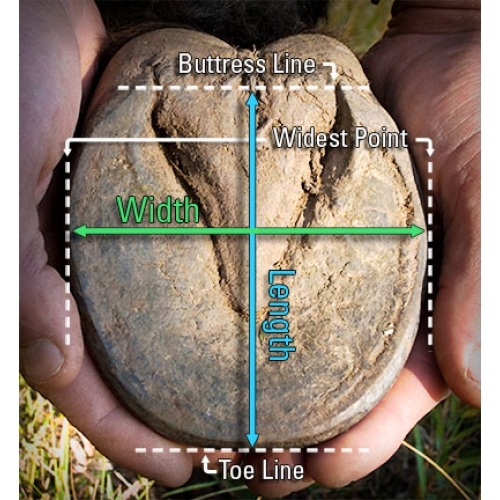 If the width and length measurements are different by more than one size, your selected hoof boot style is not recommended. * Be sure to check your measurements against an alternative boot as another style may accommodate your horse’s hoof shape better. If you are still unsure and need Help in Measuring for Hoof Boots? – Please call us on 01434 422700 or email us at sales@urbanhorse.com and we will contact you back the same working day. Our checklist of information required to fully advise you re which hoof boots would be best for your horse or pony are as follows..
What you require the boots for? How often you ride and roughly how many hours each time? How often your horse is trimmed?